I’m almost too late to be commenting on this, as the annual spring migrations of birds in our Mid-Atlantic area have been going on for some time, with some of our winter waterfowl (Buffleheads, Snow Geese, Loons) having long since departed for their Canadian and Arctic breeding grounds, and some other birds already arrived from their tropical wintering areas (notably, there have been very sizable flocks of American Robins passing through and congregating on lawns in “fallouts” when precip or frontal passage forces them to take a break). Different species have different routes, timetables, and reasons for migrating, but many, many birds are currently on the move. It’s one of those phenomena that gets lost, unnoticed while we spend days in the office – if you don’t watch, you may not realize the population in your backyard is changing. Narrowing in on just a few families, I’ve been paying attention this week to the migrations of hummingbirds (particularly Ruby-throated) and raptors. Ruby-throated Hummingbirds are impressive migrators, considering their small size and the distance they cover. Most spend the winter in southern Mexico or northern Panama, and start heading north in early February. Those who call the Atlantic Coast home have to pause on Mexico’s Yucatan peninsula, and fatten up, gorging on insects and spiders to almost double their weight (up to a hefty 6.5 grams) before crossing the Gulf of Mexico. (Though we associate hummingbirds and nectar, they are actually carnivores – nectar and sugar from our feeders merely provide the quick energy they need to hunt more nutritious prey). Some of these birds are truly athletes – departing at dusk on a still evening to cross all the way to the Gulf Coast of the US – an 18 to 22-hour flight of up to 500 miles, and along the way dropping their weight from over 6 to under 3 ounces as they convert fat reserves into fuel to keep them flying. Others are able to island-hop across the Caribbean into Florida – but it’s still an impressive journey. Once they’ve made landfall and rest up, they cover about 20 miles a day, heading north to the same area where they hatched. As I write this, the 2017 flock has started to arrive in southern and central Virginia, edging northward every day. A migration map is available here. On the other end of the size/weight spectrum, raptors (birds of prey) of all descriptions are heading north as well. Turkey Vultures, Broad-Winged Hawks, Swainson’s Hawks and others form spectacular flocks and stream by the hundreds and thousands northward, providing bird watchers the opportunity to pick a spot and see an astounding number of these birds. Some use the Atlantic Flyway, along the coast, but many more stay inland, using the air currents along the Appalachian ridges to conserve energy and soar northward. There are several locations that have become known as hawk hot-spots (such as Hawk Mountain, PA), and organizations such as the Hawk Migration Association of North America (HMANA) organize crowd-sourced migration counts to keep tabs on hawk populations, in addition to the enjoyment from seeing them. HMANA’s hawk watching period extends from March 1 to May 1, and they have several tracked, tagged birds (Broad Winged Hawks) that you can keep track of – flying from (as of this writing) Panama and Mexico all the way to New England. Particularly close to home though, are the Ospreys. The Osprey, also known as a “fish hawk” are unique birds – the only raptor to catch fish by diving feet first (they pull their feet up and forward to either side of their heads, giving them a sight line directly between their talons as they enter the water). They have a unique claw arrangement that allows their outer toe to rotate downward, providing a 2×2 talon opposition to grab slippery fish (rather than the 3 to 1 opposition of most raptors). They also learn how to carry fish in a streamlined fashion, holding one foot in front of the other so that the fish flies aligned with the bird’s body, headfirst, reducing drag and making it easier to fly with heavy loads. Around here, they also routinely squabble with Bald Eagles – the eagles would often rather steal and osprey’s catch than get it themselves, and ospreys are quick to chase eagles out of their territory. Ospreys are monogamous, but mated pairs typically spend winters apart. From the Caribbean and northern South America, Ospreys are now making the long journey home – and about 25% of all the Ospreys in the contiguous US make their homes in and around the Chesapeake Bay area. Once here (males typically arriving first) they’ll reunite, reform old bonds, and get to repairing nest sites and laying eggs – typically by mid-April. There are several sites tracking Ospreys, but the one I find interesting is this one from the Chesapeake Bay Foundation, which only tracks three birds, but shows the wide variance in where they can wind up over the winter months. I actually saw my first local Osprey today (April 2, 2017), though I know they’ve started to arrive over the past couple weeks. 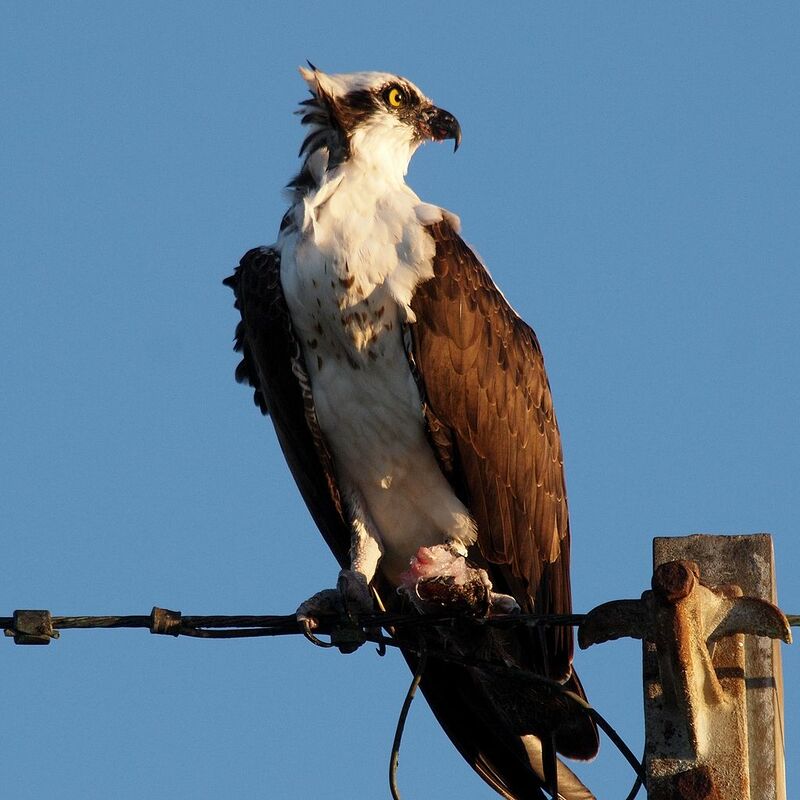 Locally, I know it’s spring when the Ospreys start carrying huge sticks out to the top of nautical day markers and platforms atop telephone poles, and it’s summer when I see three heads of fledged chicks bobbing and watching me from those same markers as I sail by. It’s good to see them coming home.